Eisenhower Pass, also known as Straight Creek Pass, is a high mountain tunnel system in the Colorado Rockies, passing under the Continental Divide. 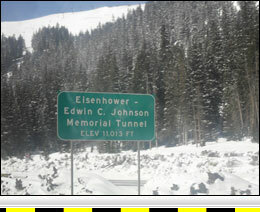 The Eisenhower Summit is located on Interstate 70, approximately 9 miles east of Dillon, Colorado. I-70, on both sides of the Eisenhower Tunnel system, has a steep descent. Eisenhower Pass is one of three steep grades on I-70 between Denver and Utah, with Vail Pass to the west and Floyd Hill to the east. 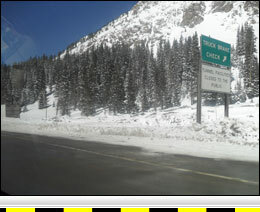 Eisenhower Pass receives a large amount of snow in the winter and often has chain restrictions for commercial trucks. Westbound I-70 from the Eisenhower Summit has a vertical descent of 2,363 feet over a distance of 8.6 miles. The westbound descent begins just after exiting the tunnel. The reported grade for the westbound descent is 7% for 7 miles. The grade is steady for approximately 6.4 miles, where it lessens to a 5% to 6% grade for the next 2.2 miles. I-70 transitions to an upgrade 8.5 miles west of the summit, or just past the 205 exit for Dillon, Colorado. Trucks experiencing brake fade are warned not to exit at the Dillon exit and are instructed to continue to the upgrade. 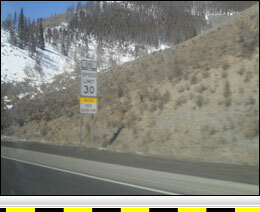 Eastbound I-70 from the Eisenhower Summit has a vertical descent of 2,530 feet over a distance of 14.5 miles. The eastbound descent begins after entering the tunnel, where a reported 1.6% downgrade is encountered. After exiting the tunnel, the grade steepens to a reported 5% to 6% for 12 miles. About four miles east of the summit, the Loveland Pass/U.S. Highway 6 bypass traffic merges onto I-70. The descent is stepped with grades varying from 5% to 6%. There is a steep grade section 12.1 miles east of the summit, before the grade flattens in the area of Georgetown (the 228 milepost). However, there is a continued lesser descent to approximately the 243 milepost before an uphill transition is encountered at Floyd Hill. Runaway Ramps: One on right at 1.9 miles west of summit. One on right at 4.8 miles west of summit.